A glimpse of Nidana Village House and Building Engineering System and its journey through big mansions (Havelies and Darwaja's) built of small red bricks to modern housing art bungalows (Kothies and Makaans). 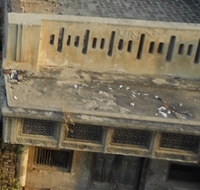 From Daat (Bung) - Chhajje (Balcony) - Ataari (Attic) - Choubare to modern balconies and varandas. From stone art jambs to iron grilles and scissors gates. Map of Village Planning Architecture: Village residential teritory forms a pentagonal shape with right-angle interactions of streets and roads across external periphery. On internal side village main street is a circular ring, interacting with various streets and squares at right-angle most of the cases. For an in-detail undestanding, please see at e-Media > Village Map page of website. Below given is a presentation on architectural engineering skills of village's architects, carpenters and artisans, who have been successful portrayers for scripting the imaginations of house owners in forms of house walls, gates, doors and balconies. I feel proud in descripting that unlike other states where a few powerful people like Thakurs and village presidents or sarpanches, (as they are shown most often in Bollywood movies. In fact our Haryanvi or on large scale to say Khapland culture whether it be social system or architectural both are found absent from movies in most of the cases. And seeing this depriving of us on this front we oftenly either feel upset or consider on screen shown culture as ours.) ours is a more vibrant and independent system where not only forward and upper castes and other social key people rather backwards and dalits also own same kind of houses. In Nidana neither today nor in old age their was any such boundation on case bases. In fact you can find the same kind of housing system throughtout castes. Whether it is Jat, Brahmin or Dalit, all have both kind of residences i.e. big mansions as well as small and simple houses. So this presentation is going to show you one more kind of consistency and uniformity from the front of village's architecture. Alas! The caste-based politics might not head in India, consequently our younger generations could have another reason to feel proud of their society and could focus on real infrastructural and development issues of lacality.